Drones are some of the hottest tech toys on the market at the moment - Star Wars-themed or otherwise - though most of us content ourselves with a few high-definition aerial shots of the neighbourhood or perhaps a quick trundle across a campsite. Not so YouTube user gasturbine101 (his real name remains a mystery), who fixed 54 drones together to create a DIY helicopter capable of lifting him up to the skies. The video clip of the stunt on YouTube has attracted well over 2 million views and is impressing a lot of aviation enthusiasts. Technically these are counter-rotation propellers (the same as those used in remote-controlled model aircraft) rather than actual drones you can buy from Amazon, but the overall effect is the same. It looks like there's some kind of garden chair and a parasol in there as well. For the more technically minded among you, the custom-built aircraft comprises six grouped control channels and has a take-off weight of 148kg. 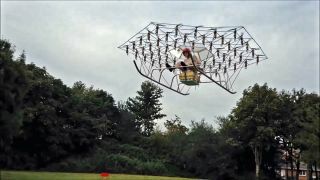 The contraption uses 22KW of power, flights can last up to 10 minutes, and the total cost is around £6,000. It's not perfect yet, though. "[The biggest flaw] is the large number of props running at high speed means the net torque reactions are relatively low, so the craft has little yaw authority," says the mysterious gasturbine101. "So it probably needs a tail rotor for spot turns." Even if the 'copter is limited in scope and range, it's good to see the spirit of British innovation and entrepreneurship alive and well. All we need now is an air traffic control system for these magnificent flying machines.